编码： 9781597020145. 分类： Bestsellers, Children's Fiction. This is the original book series that launched the animated TV show, which is now popular worldwide and broadcast on the Disney Channel in the USA. Discover the creative and fun stories where it all began! 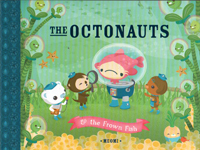 In this third Octonauts storybook, the crew meets a fish with a giant frown on his face. He looks so glum that he’s causing everyone around him to feel down also. Our heroes need to find a way to cheer him up! The Octonauts try music-making, field trips, miniature golf, and even a baking marathon, but can they make their new friend smile?